Paver Shield sealant is a thermoplastic, all acrylic polymer which seals the pavers, penetrates the jointing sand and inds the sand to the sides of the pavers creating a uniquely stabilized surface. Paver Shield is the ideal sealant for concrete paving stones, natural and manufactured stone. 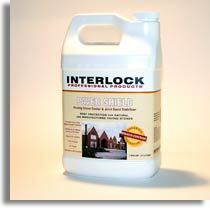 For concrete floors, concrete walls, retaining walls and brick walls use our Concrete Shield. Make sure the surface and jointing sand is THOROUGHLY DRY and free from dirt. Remove all efflorescence prior to sealing and let dry. Ensure that Paver Shield is only applied when there is no risk of rain within the next 8 hours. Do not apply in extremes of temperature (below 40 F or above 110 F). Ensure paver surface is thoroughly swept and that no jointing sand remains in the joints of the pavers. Apply to surface of pavers liberally and spread all surpluses with a SQUEEGEE. Accurate application rates are critical to ensure full joint stabilization (up to 200 sq ft per gallon). Avoid walking on the sealed area for 3 hours after application and do not drive motor vehicles on the surface for 24 hours. ALWAYS WEAR PROTECTIVE GLOVES AND GOGGLES. WEAR A MASK WHEN WORKING IN CONFINED AREAS. All uncured spillages/splashes, and all tools must be cleaned immediately. APPLICATION NOTE: It is recommended that you test a small area to assure satisfaction of appearance. If swallowed, give large quantities of water to dilute and call a physician. In case of eye contact, rinse immediately with water for 15 to 20 minutes. For skin contact, wash thoroughly with soap and water. Manufacturer warrants its products conform to the published specifications. No other warranty is expressed or implied. The user must determine the suitability of the products for their particular use. Manufacturer and any seller�s liability for incidental or consequential damages hereunder shall not exceed the purchased price of the product used.